Everyone closest to the center of Father’s nationwide transmutation circle, including Ed’s group, survives to discover that Father has used the souls of over fifty million Amestrians to suppress God within a new, youthful body. 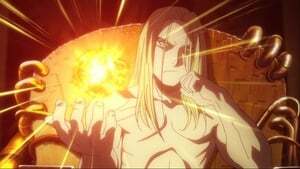 Father neutralizes everyone’s alchemy, but, before he can annihilate them, Hohenheim reveals his countermeasure: he had spent years traveling the country, placing fragments of his own Philosopher’s Stone into the earth to use as foundation for returning the Amestrian souls to their bodies. The stone fragments are activated by the eclipse’s umbra, and the souls are ripped from Father’s body back into their original bodies, which weakens Father to the point of barely being able to suppress God anymore. The eclipse then lifts, blinding Bradley with sunlight and allowing Scar to kill him. Scar activates the nationwide alkahestry circle his brother and fellow Ishbalans had been preparing, which restores everyone else’s alchemy at their greatest potential. Facing the full strength of his opponents’ attacks in his unstable body, Father retreats aboveground to find more souls and replenish his stone supply. Ed remains behind to fight Pride while everyone else chases Father. Pride tries to steal Ed’s body to replace his own unstable one, but Kimblee’s soul reappears within him and taunts him while Ed enters his body and destroys it, reverting him to the form of a small fetus-like creature. 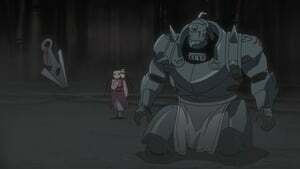 Ed spares Pride’s life and leaves to join his friends.